Need to drill the hardest ground? Our auger digger has a 20:1 slow-speed gear ratio and revolves at 180 RPM. Features a powerful Honda GX-160 engine with 8-inch semi-pneumatic tires and includes a roll cage. Auger not included. Drilling the toughest, rockiest, most extreme ground? This post hole digger by Little Beaver might be for you! 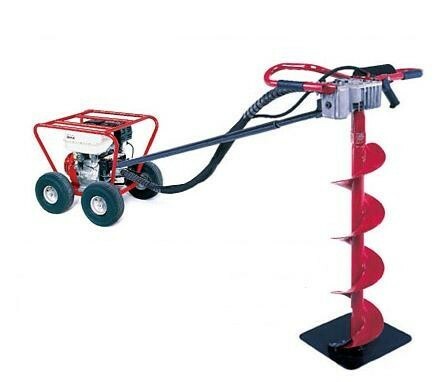 Lightweight yet powerful, this auger digger has a 20:1 slow-speed gear ratio and revolves at 180 RPM. Kickback is eliminated with torque-free digging. Not only does this increase your drilling productivity, but it also results in cleaner holes. Our mechanical earth drill reaches areas inaccessible to skid-steer loaders. When traveling over nice lawns, the roll cage transports your digger without leaving marks. Post hole digger features a powerful Honda GX-160 engine with 8-inch semi-pneumatic tires, roll cage and 20:1 transmission. Auger not included.